The leopard pattern is a spotted tabby pattern. It is marked by spots of the darker colour, most prominent on the sides of the body and the belly. The spots may vary in size and shape, but should be evenly distributed. Preference is given to rosette spots which are formed by a part-circle of spots around a distinctly lighter centre. Contrast with ground colour may not be as distinct as in some spotted breeds . A dorsal stripe runs the length of the body to the tip of the tail. The stripe is ideally composed of spots. The markings on the face and forehead are typical tabby markings, with the underside of the body having distinct spots. Legs and tail are barred. In the shorthairs, it is desirable for ghost leopard spots to appear on the bodies. The clouded leopard pattern, while derived from modifications to the classic tabby gene, is different from the classic tabby pattern, with as little bull's eye similarities possible. The pattern gives the impression of marble, preferably with a horizontal flow. Vertical stripes are undesirable. Contrast should be good, with distinct shapes and sharp edges. The belly should be spotted. Cats from the above-listed breeds which display the snow, mink, or sepia colours may be registered as Snow-Bobs. Additionally, cats from these breeds may be out crossed to other cats which are snow, mink, or sepia in colour. Due to the recessive nature of these colour genes, full colour cats will never be produced when breeding snow, mink, or sepia cats together. 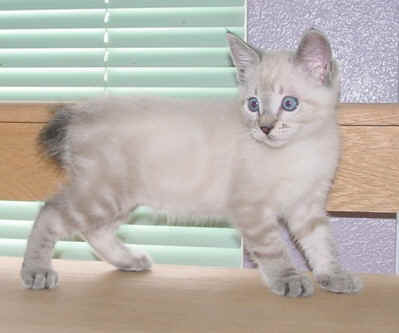 Snow, sepia, or mink kittens produced from full-colour cats of the outlined breeds may be registered as Snow-Bobs. In order for Snow-Bobs to have stud book status in the registry, they must be snow, sepia, or mink in colour. Kittens produced from Snow-Bobs bred to full colour cats may be registered as Snow-bobs if they are snow, sepia, or mink in colour. Full colour kittens who meet full registration guidelines for another breed will be registered as stud book cats of that breed. If full colour kittens do not meet full registration guidelines for another breed, they will be registered as foundation cats for that breed. Only cats which are snow, mink, or sepia will be registered as Snow-Bobs. Snow-Bob cats will be assigned registration codes indicating tail length (short <ST> or long <LT> tail), hair length (short <SH> or long <LH>), ear status (straight <SE> or curled <CE>), and whether or not they are polydactyl <PD>. Furthermore, Snow-Bob cats which meet full registration requirements for another breed will have that breed's three letter code displayed following the other registration codes. For example, a Snow-Bob out of registered Pixiebobs would display (PXB) following the other registration codes.